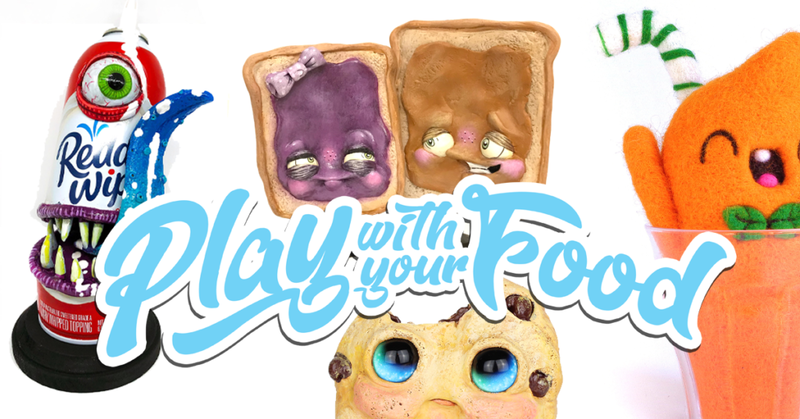 Play with your Food Custom Group Show at Mothership Toy Gallery! Your momma always said NOT to play with your food, that’s what she always said to me. However, the guys at Mothership Toy Gallery are ACTIVELY encouraging it! yup, PLAY WITH YOUR FOOOOOD! The new custom group show being held at Mothership this coming weekend! Make sure to save your appetite and bring a napkin! Our next entree *ahem* exhibit at Mothership Toy Gallery is gonna be a mouth watering 4 course spectacle of culinary toys from all over the world! With the help of the lovely and incredibly talented Jackie Harder and Kasey Tararuj we’ve created a toy menu that will leave you full and wanting more! Our spread will span each classic meal time, Breakfast to Lunch to Dinner and of course Dessert! These toy art pieces will range from cute bites, creepy crumbs, and even evil edibles! Opening tomorrow Saturday 23rd March from 6-10pm at the Mothership Toy Gallery with a whole host of awesome artists’ work involved. We have included some of the art included. The online sales beginning at 7pm Eastern on MartianToys.com tomorrow. You can go find your grub on Instagram HERE.